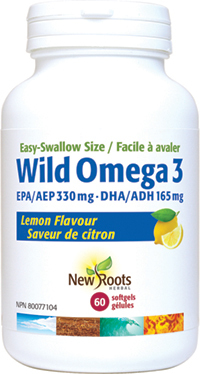 Deep sea–sourced from anchovies and sardines, Wild Omega 3 EPA 330 mg DHA 165 mg Easy-Swallow Lemon Flavour strengthens cognitive performance and heart health, while taming chronic inflammation. With their smaller size, they’re easy-to-swallow softgels, formulated for multiple dosage and benefits throughout the day. This format also lets you reap the benefits of the omega‑3 fatty acids found in the many species of cold-water fish, and that would be difficult to reach from consumption alone. As with all our products, they’re laboratory-tested for purity, potency, and freedom from heavy-metal contamination, a concern with commercial fish consumption. Here’s how they benefit your health. Eicosapentaenoic acid stimulates production of prostaglandins, beneficial compounds that mediate the inflammatory response that causes arthritis. They benefit arterial health and prevent clotting of blood that leads to heart attack or stroke. Docosahexaenoic acid is essential for brain and nerve development, and strengthens the myelin sheath that insulates nerves. Omega‑3 fatty acids also stabilize cell walls for free-radical resilience. Available in tangy, natural lemon flavour. Adults: Take 2 softgels twice daily with meals or as directed by your health-care practitioner. Sourced from wild deep sea fish oil: sardine (Sardina pilchardus) (whole) and/or anchovy (Engraulis encrasicolus) (whole). Our wild omega‑3 oils are pharmaceutical grade. Other ingredients: Natural lemon oil and natural vitamin E (from sunflower) in a softgel made of bovine gelatin, glycerin, and purified water. With 375 mg of plant sterols per tablespoon, Heart Smart Sunflower Oil is a great way to help lower your LDL cholesterol, naturally. With 375 mg of plant sterols per tablespoon, Heart Smart Safflower Oil is a great way to help lower your LDL cholesterol, naturally.